Blessed among the Mess: Big winner! I just won an award. For being random. How cool is that?! Well, technically for being "versatile" but it's basically the same as random and "random" is one of my favorite words. I've never tried to make this blog anything specific. It's just about our family, figuring out God's plan for our lives, eating and being healthy, and having fun along the way. I was given the award from Jaimie (a fellow versatile blogger and all around supermom/friend) and I'm supposed to give you seven random facts about myself and then nominate a few others for the award. I'm 5'2" and really hoping my girls get some of their daddy's height. But not a lot. Just enough to make pants fit off the rack. I love aqua. A lot. And chocolate. The color and the food. I started buying organic almost everything after Reagan had an allergic reaction to pesticide. I run (blog post about that in the works). I saw my first movie in the theater when I was 5 (ET) and decided I wanted to make movies. I kept that dream until I got to college and took film courses. I changed my major quickly to writing. I didn't like my husband the first time I met him. He was rude. Although he begs to differ. I used to be a college professor and love when my old students find me on facebook and still call me "Professor." Someday I will teach college again...until then, I get to teach my three blessings every day. Liz@Sugarplum Creations: My blogging kindred spirit. She's extremely versatile. She's a great momma to three beautiful girls, crafty as all get up, and takes beautiful photos. She's also just sweet as can be and a blessing to me. Christine@ Mommy Madness: She is a friend and a blogging guru. She has an amazing daughter (that happens to be my husband's goddaughter) and she's been on a journey that inspires me to greater things. She also loves coffee creamer nearly as much as I do. 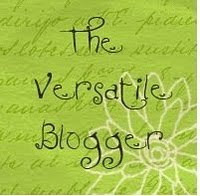 Anna@Annas Joy- If you look up "versatile" in the dictionary, I bet there's a picture of Anna. She has traveled the world, been in the Air Force, gone on missions trips, started fostering precious kiddos, and just announced that she and her husband are expecting their first bambino. Kelly @ Three Kids, a Minivan, and a Lot of Love: Kelly is crazy talented, has three adorable kiddos, takes awesome pictures, and seems to be a current day renaissance woman. You may remember that she redesigned my blog, cause she's awesome like that. Julie @ The Peapod Four plus one- Julie has three kids also (just now realizing how many folks I know with three kids). She is a wonderful mama, a wonderful friend, and tries to deny how talented she is, but if you follow her blog at all, you will see that she makes cakes and dresses and pillowcases, and quilts and shoes (yes, I said SHOES). If you've been awarded and feel so inclined, please write a post about your own randomness, er, versatility, and nominate other fellow bloggers for the award. Thank you Heather! You have no idea how you lightened my burden tonight. Love ya! And the shoes are baby shoes. Not hard at all. BUT I did see a post somewhere on adult shoes/slippers and they looked AWESOME! and difficult. Maybe someday. Awwww- Thanks Heather! Every time I see that Coffee Mate I think of you BUT you will be happy to no that every time we pour some Strawberry syrup in a glass of milk we talk about the Ambrose girls...funny hugh!? Thanks HJ! You made my day. I finally made it over to your actual blog instead of reading it in my Google reader and I LOVE the new pics and the new look. Redoing mine is on my list, so I will check out your girl. Anyway, thanks for the award and the plug. I love you and all your randomness!